Rapid commercialization along with ongoing investment toward the expansion of real estate sector will stimulate the global market growth. Adoption of advanced heating technologies in order to comply with stringent building standards and codes will complement the business landscape. The U.S. Department of Energy, in 2015, have laid down standards and provisions for the manufacturers. The performance of the products deployed across commercial and residential applications are tested on the basis of thermal efficiency and energy factor respectively. Growing consumer awareness toward the adoption of efficient heating systems along with ongoing government mandates for deployment of individual heaters across residential establishments will foster the global market growth. Growing hot water demand across offices and commercial buildings coupled with replacement of existing systems will enhance the industry outlook. Low upfront cost & simple design coupled with easy maintenance are some of the key factors which will encourage the product adoption. Availability of the product in wide capacity range make the product preferable for various residential applications. Growing need for hot water along with significant cost saving with the use of efficient variants will stimulate the residential water heater market. Government inclination toward the adoption of energy efficient appliances across commercial establishments will augment the global market. Respective regulators have established strict codes and standards pertaining to efficiency levels of electrical appliances. The European commission in 2013, has published energy labeling regulations and eco-design requirements for water heaters. 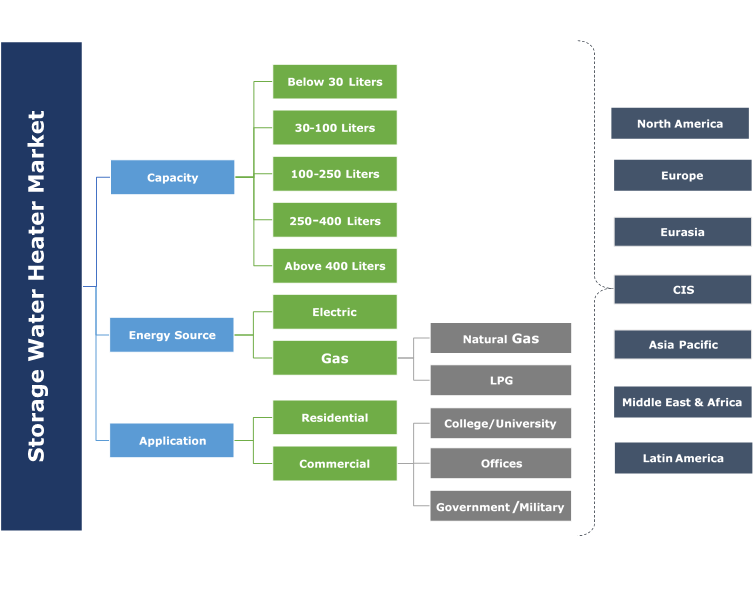 Growing development of smart cities coupled with regulatory mandates toward the adoption of efficient heating technologies will foster the 100-250 liters capacity systems. Ongoing measures for improving the carbon footprint along with rising concerns for reducing the energy bills will accelerate the storage water heater market growth. Ongoing replacement of traditional heaters owing to large standby losses along with growing focus toward adoption of cost-effective heating systems will propel the demand for 250-400 liters systems. 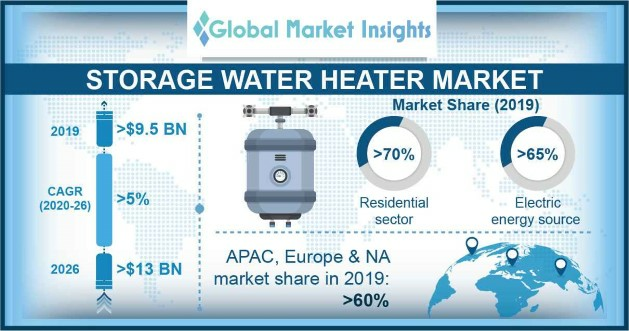 In addition, the government investment for expansion and development of commercial and residential buildings will drive the storage water heater market. Low cost and ease of installation with existing infrastructure will accelerate the electric storage water heater market growth. Low upfront cost along with development of sustainable models providing considerable energy savings and low power consumption will favor the product penetration. Limited standby losses when compared with its competitive counterparts coupled with easy integration as a backup unit in renewable heating systems will further encourage the product adoption. Gas storage water heater market is predicted to gain over 5% by 2024. Large flow rates along with considerable cost savings over the long run will accelerate the industry growth. Higher recovery rate and rapid water heating capability will positively enhance the business outlook. In addition, growing adoption of ecofriendly heating system in order to comply with laid environment standards will further complement the industry landscape. The U.S. market is predicted to grow over 2% by 2024. Replacement of existing heaters along with government inclination toward the adoption of energy efficient appliances across the new constructions will accelerate the industry growth. In addition, rising per capita income coupled with improvement in living standards will escalate the product demand. Rapid industrialization across emerging economies along with expansion of real estate sector will drive the Asia Pacific market. Availability of low-cost labor coupled with mass production capabilities provide added advantage to the investors and operating companies across the region. Frequent power outages along with adoption of cleaner fuels will amplify the business growth. Eminent players across the storage water heater market include Rinnai Corporation, A.O Smith, Bradford White, Bosch Thermotechnology, State Industries, Ferroli, Saudi Ceramics, Rheem Manufacturing, Haier Electronics, Hubbell, Linuo Ritter, Whirlpool, Jaquar, Ariston Thermo, Vaillant Group, Kanch Water Heaters and Viessmann Group. Investment in research and development for product innovation along with mergers and acquisition with leading technological partners are the key growth strategies adopted in the industry. In addition, expansion of manufacturing units across developing nations offers immense growth opportunities for established players. The storage water heater operates by utilizing immersion heating elements, controlled by microprocessors or thermostats which regulates the temperature inside the tank. The system comprises a tank, vent pipes, fueled by either gas or electricity. The heated water is stored in an insulated tank until it is utilized, eliminating the flue gas through vent pipes. The system is installed with a pressure and temperature relief valve to ensure safety, it automatically opens in case the pressure inside the system exceeds the critical limit.